"Finally, I have arrived. At the end of the path of the strongest that I yearned for." 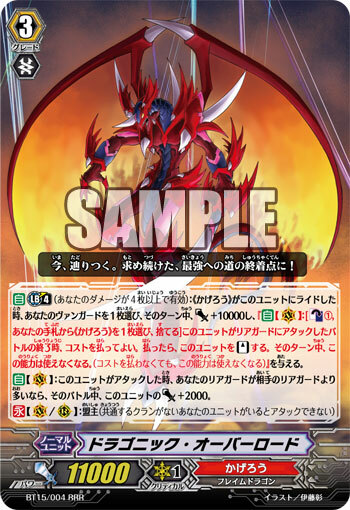 The mighty general of “Kagero” who bears the title of “Overlord”, he who reigns over all other dragons, and has been declared by the empire to be the strongest ever to live. Though he dabbled with forbidden powers in a previous war, it was not enough to kill him, no, it merely sent him into a seemingly eternal slumber. 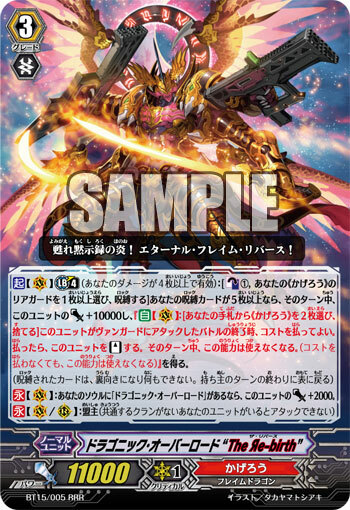 Determined to be a severe threat to “Link Joker”, even in this state, he was sealed along with the heroes “Blaster Blade” and “Blaster Dark” and so forth, but was ultimately released safely. In order to avoid this from happening again, he was placed in a solid, secure death shrine (say, morgue) deep beneath the Empire. However, he was treated as officially dead, as there was no sign he would ever awaken again, and so many of the upper crust began to suggest “Maybe we should dispose of his body”, for fear of him being “Яeversed”. In this deep place, where the noise of the outside world couldn’t reach him, he laid sleeping in a gigantic coffin, protected by multiple magical and spiritual barriers. Unaware that his day of “Яebirth” was coming closer with each and every passing second, the Overlord still continues to sleep. "Reborn flames of the apocalypse! Eternal Flame Яe-birth!" The great monarch whose name was once associated with being the strongest, the one armed with weapons capable of ruling over all dragons… “Dragonic Overlord”. The Empire’s forces were outnumbered by the unending onslaught of the “Link Joker” Invasion. The invasion kept going until it reached the grand coffin where his lordship, the Overlord, lay sleeping. One of the top goals given to the Star-Vaders was to reclaim the three legendary heroes. Judging the barriers nearly impossible to break, they tried to do what they did when they invaded the territory of “Aqua Force”: Extract and replicated Overlord’s soul, and “Яeverse” it. However, just as they got to his mind, the underground chamber was engulfed by an inferno that that pierced through the very heavens themselves. What appeared from that dark, ominous inferno was the most savage, strongest dragon in the Empire, who had stolen the power of nothingness for himself. He never died, never gave up, never let himself be tied down… … Not noticing any of Link Joker’s riffraff, he soared forth. The sheen of his sword shining on the distant white earth below. "There is only one thing I’m concerned with, ONE THING I WISH FOR! TO SETTLE THE SCORE WITH MY ARCHNEMESIS!" Bushiroad Monthly Novel wrote: The Star-vaders carried out an attempt to bring the three heroes in the past to their side via the power of Reverse. They snuck into Dragonic Overlord's tomb, under the cover of the chaos created by Vowing Saber Dragon "Яeverse" and Dauntless Dominate Dragon "Reverse". Their first attempt was to make off with the entire body of Dragonic Overlord . Since that objective was proven to be too hard, they just directly connected to the target's mind, by duplicating its consciousness and Reversing it later (Just like how they did with Maelstrom). Meanwhile, Dragonic Overlord met a mysterious entity in its mind. The entity promised Dragonic Overlord the power to wake up from its slumber, but in return, the entity wanted a certain Swordsman of Light named Blaster Blade dead. Just as Dragonic Overlord was about to take the power, something inside itself snapped. "No! Power is not something that is to be given! It is something you grasp with your own hands!!" The Star-vaders that snuck in connected successfully with Dragonic Overlord's consciousness, however during the attempt the consciousness of Dragonic Overlord woke up from its slumber, burning all the Star-Vaders around it. The Void that was inserted into its mind was burned to ashes by its exceptionally strong soul, and became but another source for its power-up. "My name is Dragonic Overlord! One who bears the title of 'Overlord.' Sometimes I am a tyrant, sometimes I am the strongest general in the Empire until everyone calls me the Grim Reaper! I have only one intention and one wish—"
"To settle things with my rival, ONCE AND FOR ALL."